Umbilical Endometriosis: Surprise or Ignorance? Endometriosis is a pathology in which the presence of functioning ectopic endometrial tissue can be observed that can appear in any location [1,2]. The appearance of endometriosis in the abdominal wall is more frequent in women between 20 and 40 years old in a period of time between 2 and 5 years after a cesarean section . We present the case of a patient who presented this pathology without a history Obstetrical gynecologists of interest for what we consider an important and unusual finding. We present the case of a 42 year old woman without history of interest who came to the general surgery clinic for presenting a pain and umbilical tumor of 1 year of evolution that had been treated with unsuccessful antibiotics and with an ultrasound that reported umbilical abscess of 2 × 1, 6 × 1 cm. The patient is explored and a hard umbilical tumor of 2 cm in diameter is observed without inflammatory signs. Herefore, the diagnosis of "umbilical cyst" is sent to the operating room of local procedures for surgical treatment. Under local anesthesia, the lesion is excised by removing a cystic lesion that is not suggestive of an abscess. The pathological anatomy of the surgical specimen is reported as a lesion compatible with cystic endometriosis with extensive fibrosis and signs of chronic bleeding (Figure 1). 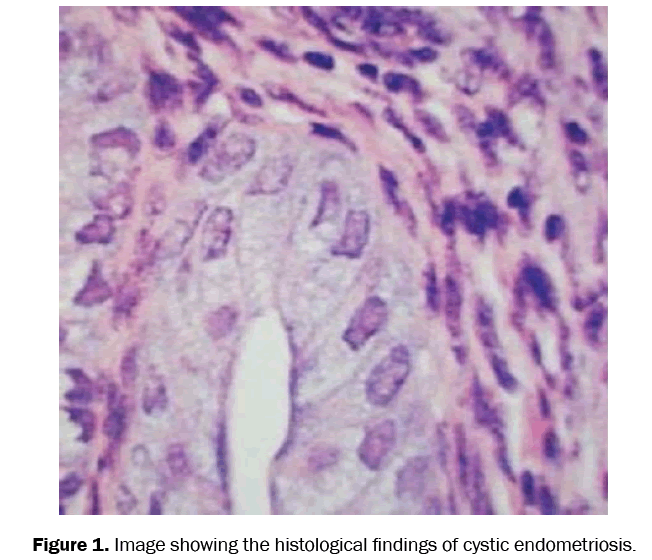 Figure 1: Image showing the histological findings of cystic endometriosis. With these findings, the patient is diagnosed with "umbilical endometriosis" being derived to Gynecology for follow-up and treatment. Endometriosis of the abdominal wall may present clinically as cyclical abdominal menstrual pain associated with the presence of a palpable mass that usually appears after weeks or months after a cesarean section [4-6]. It is essential that the general surgeon include in his diagnoses. This entity is usually related to any painful nodule located in a scar of a previous gynecological or obstetric laparotomy, in a woman of reproductive age . However, the extraordinary aspect of the presented case is its appearance in a woman without gynecological history of interest, so this differential diagnosis must be extended to any abdominal wall tumor of uncertain etiology in women of reproductive age. In most cases, the ultrasound study of the lesion can guide the etiology . Pharmacological management with oral contraceptives provides transient relief,but the treatment of choice is the local excision . Abdominal wall endometriosis is an unexpected pathology for the general surgeon so it must be included in its list of differential diagnosis of an abdominal wall tumor of uncertain nature in women of reproductive age. Although it is more frequent in the presence of a history of gyneco-obstetric laparotomies, it may present as in the case reported in women with no history of interest, so the surgeon must re-evaluate his wits and be a diagnosis to be taken into account. Park SB, et al. Sonography of endometriosis in infrequent sites. J Clin Ultrasound. 2008;36:91-97. Horton JD, et al. Abdominal wall endometriosis: A surgeońs perspective and review of 445 cases. Am J Surg. 2008;196:207-212. Villalta J, et al. Endometriosis en la cicatriz de una cesárea. Cir Esp. 2006;79:313-315. Hensen JH, et al. Abdominal wall endometriosis: Clinical presentation and imaging features with emphasis on sonography. AJR Am J Roentgenol. 2006;186:616-620. Blanco RG, et al. Abdominal wall endometriomas. Am J Surg. 2003;185:596-598. Woodward PJ, et al. Endometriosis: Radiologic-pathologic correlation. Radiographics. 2001;21:193-216. Teh J, et al. Abdominal wall endometriosis: Comparative imaging on power Doppler ultrasound and MRI. Clin Radiol. 2004;59:74-77. Zhao X, et al. Abdominal wall endometriomas. Int J Gynaecol Obstet. 2005.